It’s hard to beat a simple dish of fresh pasta topped with homemade marinara sauce. The key is using quality products and when you have those these simplest of dishes come to life. The Italians have relied on the best of the best tomatoes for centuries: Sun-kissed San Marzano tomatoes. They’re stronger in flavor and much sweeter than most any other variety. And for that reason it’s hard to replicate the flavor of the marinara sauces you find in southern Italy. Our tomatoes require the help of a few flavor boosts, a dash of sugar being one of them. This marinara sauce is slow-simmered with a variety of herbs and seasonings for 2 hours. 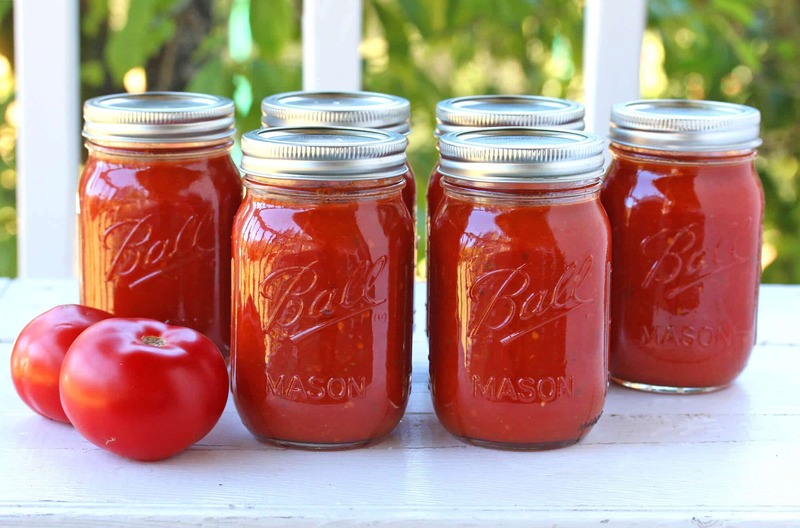 The end result is a delicious sauce you can either eat right away, freeze or can for long-term storage so you can enjoy the vibrancy of Summer all year long! The use of dehydrated onions is especially suited to canning as it provides a better flavor long-term. Select the best tomatoes you can find. The ideal tomatoes are ones that are very meaty with few seeds. Roma tomatoes fall into that category and are the most readily available and they, like other paste tomatoes like San Marzano’s, develop the best flavor when cooked down into a sauce. That said, you can use whatever tomatoes you have available and if they’re grown in your own garden so much the better. Blanch the tomatoes for a minute in boiling water to loosen the skins. Peel the tomatoes and squeeze out and discard the seeds. Chop the tomatoes. Place the tomatoes in a large pot with all the ingredients (except for the citric acid/lemon juice). Bring it to a boil, reduce the heat to low and simmer, uncovered, for 2 hours, stirring every once in a while. Adjust seasonings to taste. Discard the bay leaves. Use an immersion blender or transfer to a blender and puree until desired consistency. I use and recommend Cuisinart’s Immersion Blender, I’ve been using mine for 8 years and it’s still going strong. The sauce is ready but the flavor is even better after a day or two. You can either enjoy the sauce now, freeze it, or can it for future use. Before you fill the sterilized jars with the marinara sauce, add 1/4 tsp Citric Acid per pint or add 1 tbsp bottled lemon juice per pint (double those quantities for quarts). This is per USDA guidelines as a requirement for safe canning. Fill the hot marinara sauce into the jars leaving 1/2 inch headspace. Wipe the rims of the jars with a damp cloth. Screw on the clean lids and rims. Next you’ll use a water canner to process the jars. This complete canning set has everything you’ll need. Place the jars in the boiling water canning and process for 35 minutes for pints and 40 minutes for quarts (wait for the water to return to a boil before you start the time). Turn off the heat and let the jars rest for 5 minutes before removing. At 1,001 to 3,000 feet (305 to 914 meters) above sea level: increase processing time by 5 minutes. At 3,001 to 6,000 feet (914 to 1,829 meters) above sea level: increase processing time by 10 minutes. Above 6,000 feet (1,829 meters) increase processing time by 15 minutes. Carefully remove the jars from the water canner and let them sit undisturbed for 24 hours. Check the seals. Store in a cool, dark place for at least a year but for best flavor use within 6 months. Rich and vibrant in flavor, you can enjoy this delicious marinara sauce all year long! Blanch the tomatoes for about a minute in a pot of boiling water to loosen the skins. Peel the tomatoes, squeeze out and discard the seeds. Chop the tomatoes. 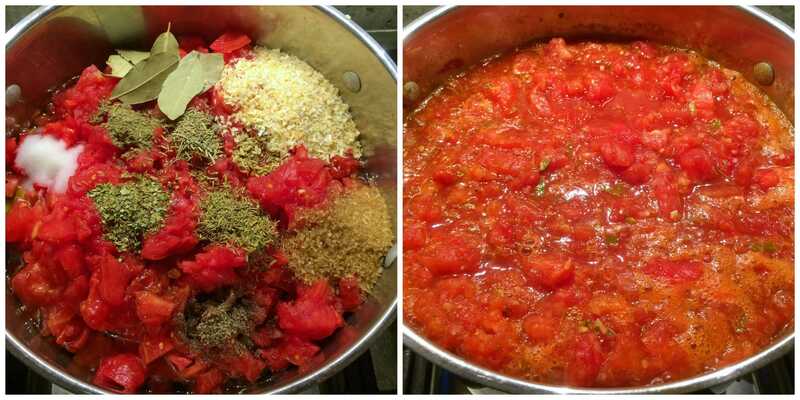 Place the chopped tomatoes in a large pot along with the remaining ingredients (except for the citric acid). Bring to a boil, reduce the heat to low and simmer, uncovered for 2 hours, stirring every now and then. Discard the bay leaves. Adjust the salt and pepper to taste. Use an immersion blender or transfer to a blender to puree until desired consistency is reached. You can use the sauce now (flavor gets better in a day or two), freeze it or can it for long-term storage. To can the sauce: Place 1/4 teaspoon citric acid or 1 tablespoon bottled lemon juice in the bottom of each sterilized pint-sized jar (double the quantity for quart jars). Ladle the hot marinara sauce into the jars, leaving 1/2 inch headspace. Wipe the rims clean with a damp cloth. Screw on the clean lids and rims. Place the jars in a boiling water canner and process 35 minutes for pints and 40 minutes for quarts. Turn off the heat and let the jars sit for 5 minutes. Remove the jars and let sit undisturbed for 24 hours. Check the seals. Store in a dark, cool place for at least a year, but for best flavor use within 6 months. Homemade sauce is just so much better! Can’t wait to try your recipe. This looks so perfect! I would use this for everything! This marinara looks so bright and fresh! So great to have all year long by canning! I’ve never canned before! This sauce sounds heavenly, and the tips you provided are perfect for a beginner like me! Homemade Marinara sauce tastes so good and fresh. I’ve never canned before but your tips make it sound so easy. This is something I would love to do. I can’t wait to try this! I’ve always been intimidated by canning, but this makes it look so easy! I’ve always been trying to learn canning! I would love to start with this one! This looks so good. I love homemade marinara. Hi Kathryn, the sugar is added for flavor not for canning safety. The sugar helps compensate for today’s tomato varieties lacking the sweetness they used to and it makes a significant difference in the flavor of the sauce. Keep in mind too that it’s only 3 tablespoons divided between 6 pints. But yes, it can be omitted. I’ve been making marinara sauce for over 50 years and often try new recipes as I see them either in cook books or online. This is undoubtedly the worst recipe for marinara sauce I’ve ever seen. You haven’t even tried this recipe, Frank, what are basing that conclusion on? The list of ingredients — rosemary, sage, thyme, citric acid, brown sugar! In a marinara sauce? This very well may be a good ‘some type of sauce, but is a very long way from being called a marinara sauce. Frank, here is the definition of marinara sauce: “Marinara sauce is an Italian tomato sauce that originated in Naples, usually made with tomatoes, garlic, herbs, and onions.” Rosemary, sage and thyme are Italian herbs. Not sure what you find so alarming about that. As for the brown sugar, I explain that in the post – today’s tomato varieties leave a lot to be desired and are far less sweet than they used to be. 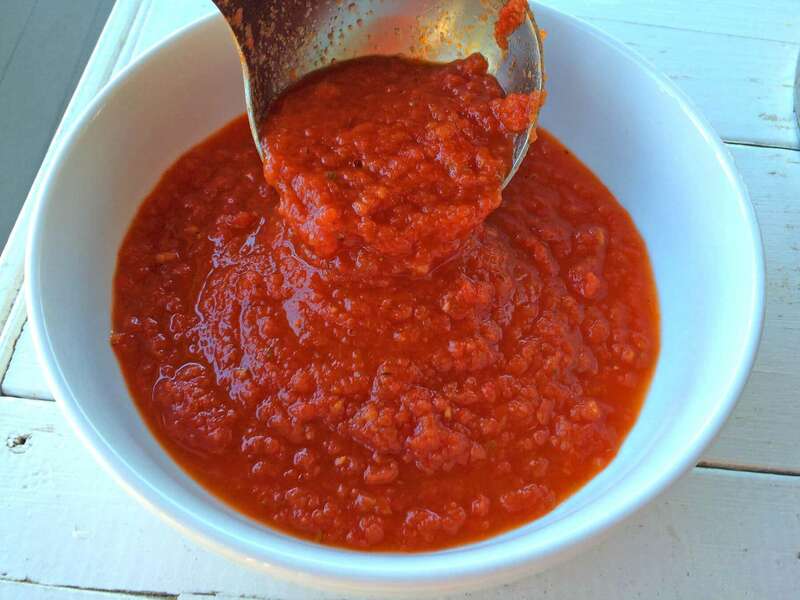 The sugar, a very common addition now to tomato sauces, helps remedy that. The citric acid: You’ll note from the title that this recipe includes instructions for canning and the citric acid (or lemon juice) is a requirement to get the pH level below 4.6 for safe canning. i make it quite often. made it the other day without peeling the tomatoes before cooking, and while boiling, the peel seperates from the “flesh” and can be lifted with a fork. i add garlik, and yes, can be made without sugar. by the way, uf short of fresh tomatoes, canned, peeles and crashed tomatoes (800 grams can) can be used. enjed your recipe. thank u. Thanks for feedback, Zohar, and I’m glad you enjoyed it! This looks very interesting. How did you calculate your nutritional breakdown and is it accurate? I do find the sugar count high for only 3 tbsp of sugar. Hi Gare, the software populates the nutrition info automatically. This recipe makes 6 pints and this case the one serving in the nutrition box is referring to one pint. This sauce looks amazing! Can it be done in the slow cooker? If yes, how much time do you recommend? Thanks, Alejandra. Yes, this should work really well in the slow cooker – place all the ingredients in the slow cooker (except for the citric acid or lemon juice) and I’d aim for around 2-3 hours on HIGH or 3-4 hours on LOW (you’ll just need to check it to see when it’s thick enough). And leave the lid off so the sauce can evaporate and thicken. Making this now. The only difference is I used two 6lb cans of tomatos. Hopefully it turns out ok. Awesome, let us know how it turns out! 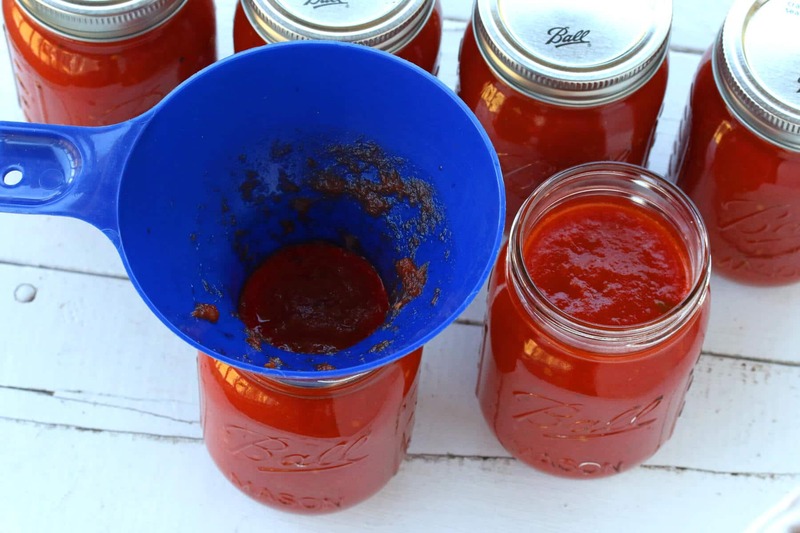 I’m getting ready to make another batch for canning – it’s so rewarding being able to reach for a jar of ready-made homemade marinara. I’ve never done this before, but I gave it a shot! I had well over a peck but under two pecks of tomatoes and I produced 4 quart jars and 3 pint jars. I couldnt decide whether to puree or not. I pureed two quarts and the sauce turned paler, so the next quart I only pureed half the jar. The fourth quart I didn’t puree at all, I will label that jar spaghetti sauce instead of marinara. The 3 pints I went back to pureeing half the liquid. We’ll see.. It looks thinner than regular spaghetti or marinara sauce to me, so I’m nervous I did it wrong! I let it simmer A LOT with the lid off, maybe 3 hours instead of two hoping it would thicken up which it did a bit but I’m still nervous! Also, I forgot the lemon juice in all the chaos for the 4 quart jars, I’ll just have to use those quicker than normal and hope there was enough acid in the tomato varieties I used! I remembered it for the 3 pint jars though. Hi Kris, depending on the variety of tomatoes you’re using it may very well take longer to thicken (some varieties have much more water than others). And yes, since there’s no lemon juice in them you’ll either want to freeze the sauce or keep it refrigerated and use it within a week. Is it ok to use fresh herbs in this recipe or are dried used for a reason? If fresh is ok, what quantity would you recommend please? Hi Karen, dried herbs often used for dishes that are simmered for a long time because the long cooking process coaxes the oils/flavors out of them and leaves them soft. For those who don’t grow their own herbs, dried herbs are much cheaper. But you can definitely use fresh herbs instead and generally you’ll use 3 times the amount in fresh herbs that you would use for dried (so instead of one teaspoon dried you would use three teaspoons fresh). I have about 1-1/2” left and am out of sauce. Can I just open a can of tomato sauce and add a little to get my last jar full? Hi Kathy, yes, that should be fine. I grew san marzano tomatoes and used my first harvest to try out your marinara recipe. 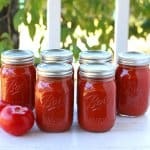 This is the BEST marinara sauce I have ever made or tasted! My only comment for the haters is “Don’t knock it till you try it!”Thanks for this awesome recipe! Fantastic, Joi, I’m thrilled to hear it, thank you! Would it drastically impact the sauce if I omit the fennel? We have an allergy to fennel in our house… if not, I’ll give this recipe a try this week. Hi Megan, the fennel does contribute flavor to the sauce but it isn’t necessary to include so feel free to omit it. Just made this sauce today and love it! Canned 7 pints and had another one left over to use with some spaghetti. Delicious! That’s fantastic, Barb, I’m so happy to hear that and appreciate the feedback, thank you! Looking for a recipe for Marinara and came across yours. Would it be really awful to leave out the bay? I hate the taste of bay and can frequently pick it up in foods. Other than that this looks fantastic. I’m 70 and love canning my own foods. Went through breast cancer and like knowing what is in my food. Thank you. great recipe exc too much thyme for me. I’ll drastically reduce in the next batch of this recipe. Making more this week w/ frozen garden toms. My go to marinara. Great! I’m glad you enjoyed it, Keith, thanks for the feedback! So,I am new to this canning and preserving. Could this be froze in freezer bags? I would assume everything would have to cool first? Hi Lyn, yes it can and yes, cool it first then freeze it. I did some research to be sure and your amount of citric acid to be added for canning is twice what is recommended. Everything I found says 1/4 tsp per pint and 1/2 for quarts. I have never heard of dried/dehydrated minced onion. Where do you find it? Or how do you dehydrate it without any special equipment? I only found onion granules in the bulk spice section of the organic store. Is it the same thing as dehydrated onion? Would the same amount apply to this form factor. Second question is about fennel. Do you mean fennel seeds or fresh? Is it the same as anise? Hi Nat, yes, onion granules are the same thing and yes, this refers to fennel seeds, not fresh. If you have a hard time finding the fennel seeds or don’t have any other use for them, you can omit them. I like the flavor profile they add but it will also taste good without them. Happy canning! 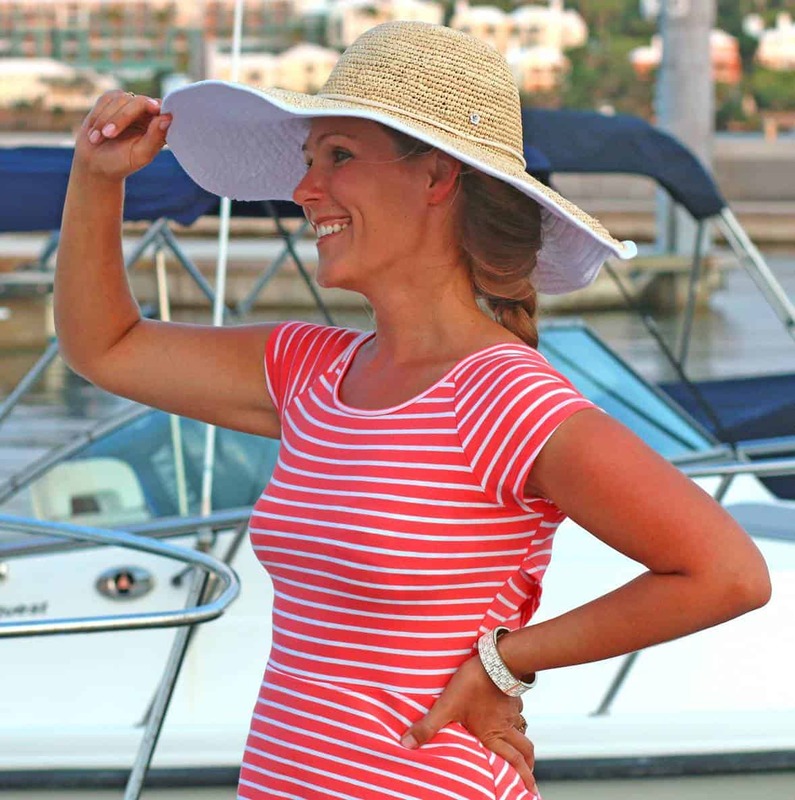 Thank you so much Kimberly for a super fast response! I was literally just beginning to use your recipe to prep my freshly picked Ace tomatoes! Also, have you had any experience with Ace tomatoes (a hairloom variety, which is extremely flavorful, juicy, but low acidity)? Also, I dont have a citric acid, but have plenty of lemons. Can those be used instead and if so, in what amount? You’re welcome! I’m not familiar with Ace tomatoes but they sound fantastic. Yes, you can use lemon juice instead of citric acid but it needs to be store-bought bottled lemon juice, the reason being that the pH of fresh lemon juice fluctuates and consistency is important for safe canning. You would add 1 tablespoon in the bottom of each pint-sized jar, or 2 tablespoons per quart-sized jar. I’m absolutely thrilled to hear that, thanks so much for the feedback! I tripled your recipie…..36 pounds of Roma tomatoes!! WOW MY HANDS ARE TIRED. Just came to a boil on the stove so now I start my 2 hour simmer. I am excited to can this and have a question for you…why is there no garlic in your recipie and if it will work how much would you suggest adding? Thank you for the recipie. WOW, Michael!! That’s awesome that you’re going to have that much homemade marinara to enjoy throughout the year. The garlic – that’s just personal preference, the flavor of it tends to alter over the course of long-term storage. You can certainly add some if you like. I’d probably aim for 1 clove of garlic for every 2 pounds of tomatoes, so about 18 cloves of garlic or a little less for your 36 pounds of tomatoes. Happy canning and I hope you enjoy the fruits of your labor! It’s 1245 here in Texas and I am just starting the canning process…I let the sauce cook a bit longer due to the sheer amount. It is yummy and I can only imagine how it will taste in a few weeks when it has time to “settle’. Thank you again and please know if it weren’t for selfless people like you myself and many others would only dream of canning and cooking in our kitchen…your the best! O and that sauce is pretty darn good too! Thank you so much and I’m so glad you enjoyed the sauce! I finally got all my tomatoes peeled and seeded, although I see a some seeds in the sauce as it’s simmering. Also I collected all the juices that escaped while peeling and seeding and poured it back in with the chopped tomatoes – hope that’s ok. Do the seeds affect the canning process? If you were to include garlic, when would you include it in the marinara – at the time of consumption as you were reheating the sauce or at some point while the marinara is simmering? Since I don’t have my canning equipment right now is it safe to can when the equipment arrives in a few days? Maybe I should just freeze it this time and do canning when I’m totally ready. I’m new at making my marinara sauce from scratch. Usually I make it using canned tomatoes. I can’t wait to see how this turns out. The kitchen already smells heavenly. Great instructions by the way. Hi Daniel, no, the seeds don’t affect the canning process, they’re perfectly fine. I would just add the garlic in with everything else when you simmer the sauce. You can definitely freeze the marinara if you like. 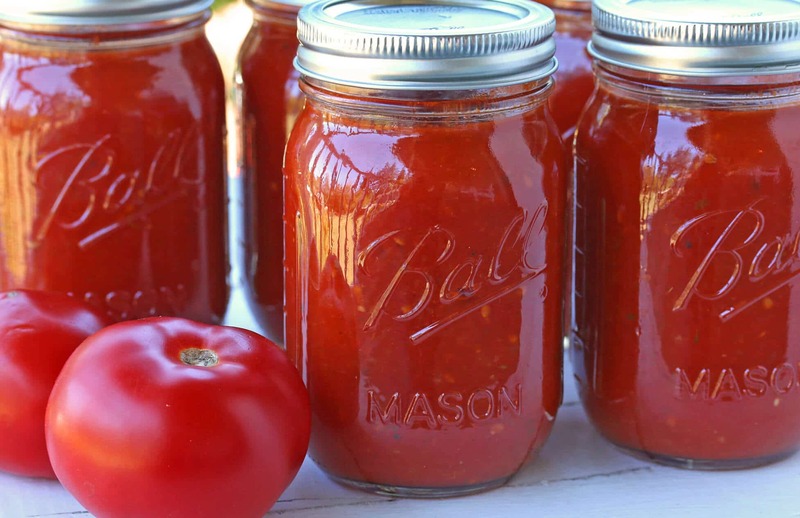 The important thing with canning is that the sauce needs to be ladled into the sterilized jars while it’s hot – simmering the sauce kills any bacteria. So if you’re going to keep the sauce for a couple of days and then can it, be sure to bring the sauce back to a boil and then can it. I’m glad it smells good and hope you’re equally happy with the flavor! I didn’t add the rosemary because I’m not a fan. I did add 6 cloves of garlic and 1 can of tomato paste for colour. awesome recipe. i will make this again. That’s awesome, Tracy, thank you! Hello! Is the 12 lbs of tomatoes in the ingredient list before or after you prep them? I had about 30 lbs and now prepped them. Hi Gretchen, it’s 12 lbs of whole tomatoes, before prepping. Just double+ up on the other ingredients and your sauce will be perfect. If I were to add garlic would you recommend fresh or powder? And if fresh how many cloves? Or Is it better to add to it once I’m ready to eat? Would adding red pepper flakes affect the safety of it? Should I close to triple up on the spices since I have 30 lbs? Next to your double I assume that is what you meant by the plus sign. Thanks so much for your quick response! Does the amount of spices used affect the safety of the recipie? I made your recipe one other time (I loved it) and I thought this time I had more tomatoes (looks are deceiving once they are peeled and cut up). I only did the amount of ingredients as you listed because if I add more it looks like it will be over whelming. I really just want to make sure everything is safe. Hi Gretchen, no, the spices won’t impact the acidity/safety. Some fresh herbs can impact the pH level but you can safely alter the quantities of dried herbs. This may be a duplicate comment. If it is I’m sorry! If I had herbs that were fresh in the garden this summer and I dried them, is that the same as dried herbs from the store? I used thyme and basil In dried in the quanitites your recipe stated. Sorry about all the questions! I want it to be safe!! No problem! Yes, those are perfectly fine. I’m not a fennel fan and like sage only in certain things. I think I’ll leave those off along with the sugar. I must have garlic I marinara also. I’ve canned plenty of times and this looks good. Thanks for sharing. Can you use fresh onion, and if so how much many cups? Hi Spicie, yes you can, I would use 1 large onion (around 1 1/2 cups). Thank you for this recipe. I enjoyed it very much. This marinara was easy to prepare once I slipped the skins off all the tomatoes and had them cut up! The smell was amazing and I loved that I could use some of my dehydrated garden herbs….my garden garlic, onions and tomatoes. I only have one recommendation.. I found 2 Tablespoons of Sea Salt too much which made the marinara too salty for our taste. I would suggest add ing 1 Tablespoon and sampling the sauce before adding the other Tablespoon. Thanks again for the recipe. Wonderful, Diane! Yes, salt preferences vary greatly from person to person and it’s definitely easier to start with less and add more. Thanks for the feedback! Fantastic, Sandy, San Marzanos are so good! I got about 6 pint jars out of it and that will vary a little depending on the variety of tomato you’re using. Happy canning! I really want to can this on Monday, have you ever tried to can the recipe and if so, does it turn out? I do salsa all the time but want to try a marinara sauce. Can I add the lemon juice to the batch, or is it better to put it in the bottom of each jar? Sorry for all the questions, I’ve never made marinara before. Hi Wanda, yes, this sauce is made specifically with canning in mind. Scroll down to the bottom of the blog post and you’ll see the recipe box with the canning instructions. HI Kimberly, I wanted to ask your thoughts about using Cento Organic San Marzano canned tomatoes in place of the fresh? 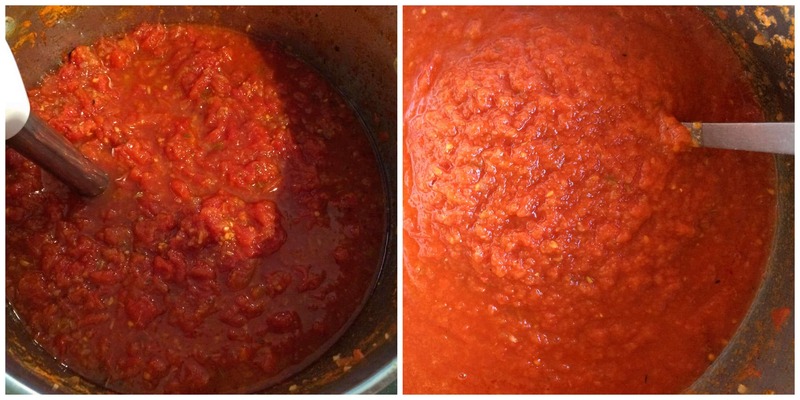 I have been making a family favorite Marinara and Pomodoro recipe with them for years. Also wanted to ask about the Pomodoro, as I use fresh parmesan cheese rhinds in that recipe and wondered if the cheese in that sauce would hold up if canned properly in your opinion? Hi Mike, yes, you can use canned tomatoes instead. 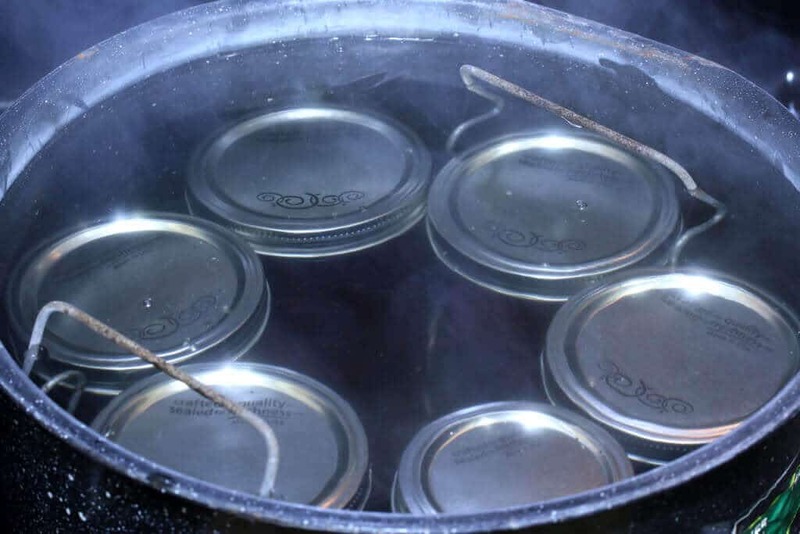 A lot of home canners include dairy items in their pressure canned recipes but the official guidelines strongly advise against canning any dairy products.